Central lines are often needed in the sickest patient, and after we place them, we usually need to use them quickly. Traditionally, this means tapping your foot anxiously while waiting for a chest xray to confirm that the catheter is in the appropriate place. Well guess what - it turns out that ultrasound is pretty good at determining correct placement, at the bedside, right away. 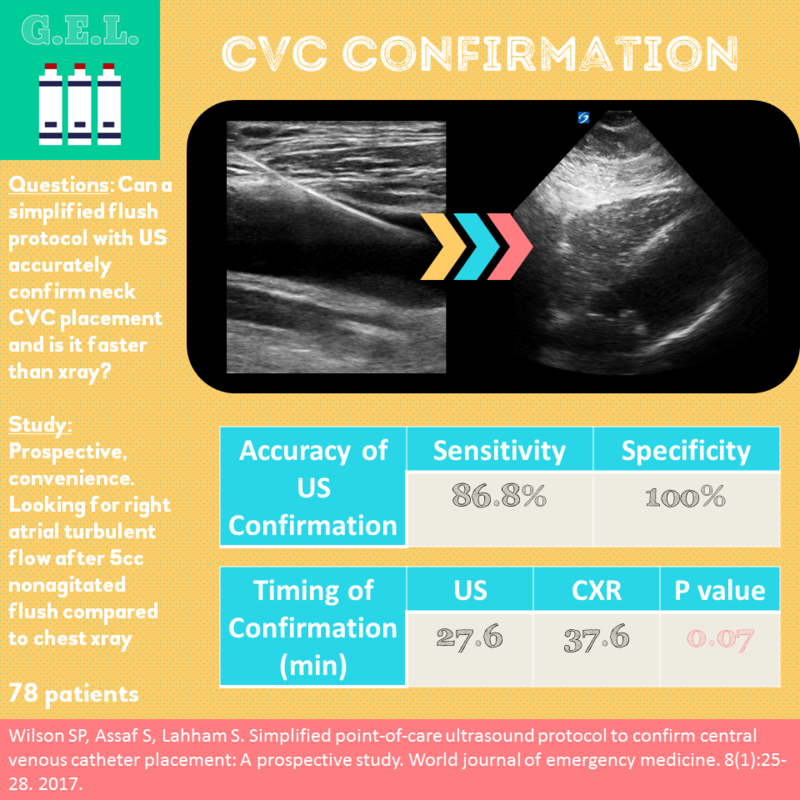 This study attempts to use a simplified flush protocol to see how accurately and how quickly ultrasound can confirm catheters placed in the internal jugular or subclavian veins. Do we still need the chest xray? Acute chest syndrome (ACS) is a feared complication of patients with sickle cell disease. Usually, whenever there is clinical concern for ACS, the first step is obtaining a chest xray. 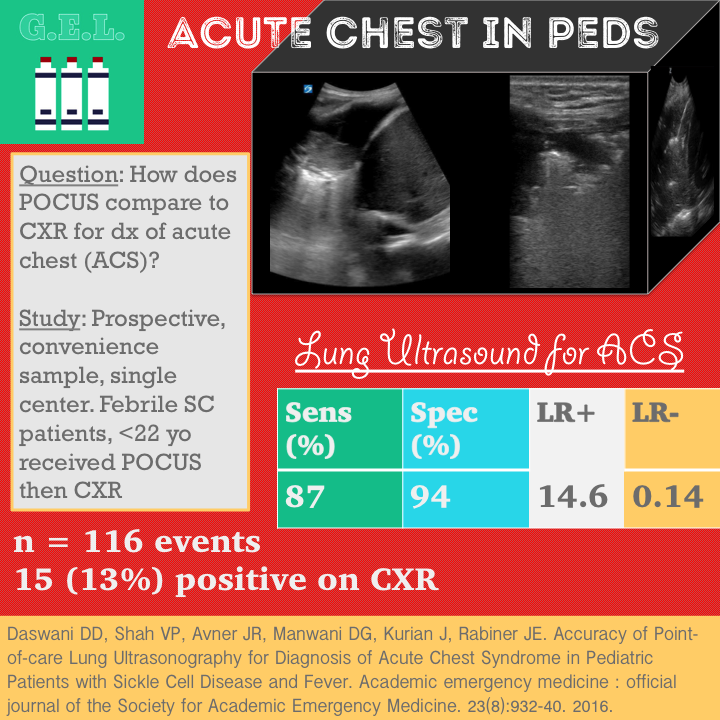 In an effort to reduce radiation to our vulnerable youth, this study examines the accuracy of point of care lung ultrasound in making the diagnosis compared to the chest xray. 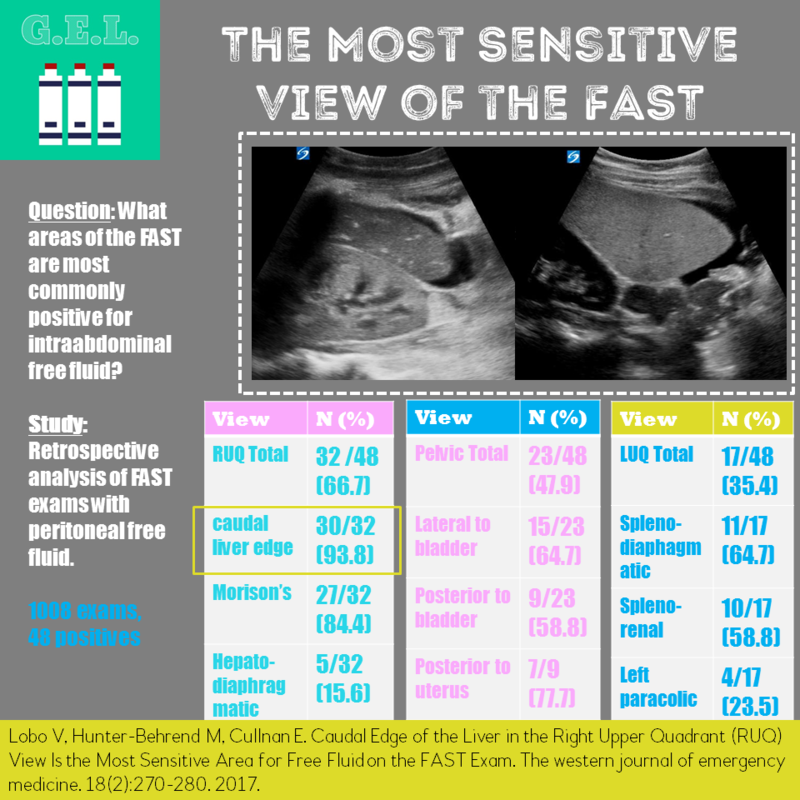 The FAST exam (focused assessment with sonography in trauma) looks for two things - intraperitoneal free fluid in the abdomen and fluid around the heart. With regard to the abdomen, there are a lot of places the fluid can go. It would be helpful to know in which areas the fluid most commonly collects so you can make sure not to miss any. These authors break down each of the three abdominal FAST views (right upper quadrant, left upper quadrant, and suprapubic/pelvic) into three "sub-quadrants." Then they take a look at all the FAST exams done at their institution over a year and a half and determine how often the fluid goes to each of those places when there is a positive exam.